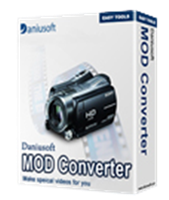 Daniusoft MOD Converter is a powerful camcorder video converter from Daniusoft. The Daniusoft MOD Converter has been designed to convert MOD TOD files to most of the popular video files format with fast conversion rate and excellent quality. This conversion software is also able to transfer movie from camcorders to portable player which includes iPhone, iPod, Apple TV, Zune, PSP, Pocket PC, PDA, PS3, Archos, iRiver, Creative Zen, Xbox 360, PMP, Smart Phone, Mobile Phone and etc. Furthermore, it also features with several editing functions such as video cropping, movie trimming, and video effect adjustment for users to convert MOD video files according to their favor. Able to convert MOD TOD files to AVI, MP4, MPEG, M4V, WMV, ASF, MKV, 3GP, FLV, VOB, MP3, AAC, AC3, WAV, WMA, M4A and etc. Able to copy movies from camcorders to play on iPhone, iPod, Zune, PSP, Apple TV, Creative Zen, Pocket PC, Walkman, Mobile Phone and etc. Extract Audio from MOD TOD Video files and convert Mod to MP3, M4A, AAC, MKA, WMA, WAV and etc. Accurately Trim Videos by setting the start time and end time. Capture your favorite pictures from the video file anywhere and anytime. Adjustable resolution, bit rate and frame rate for output video file. Customizable sample rate, bit rate, and channel for output audio file. Visit Daniusoft facebook, and and click on the “Like” button to become the fans of Daniusoft, then enter the first name, last name and email address and click on “Get It Free Now” button. Use the received keycode and download link to install and activate Daniusoft MOD Converter.